To keep myself from going to sleep in the middle of the day, I started this. 'tis moi! 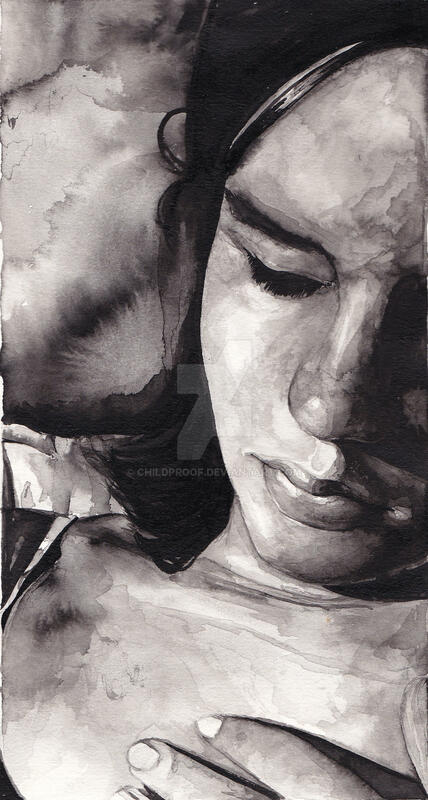 I was planning to do something like this, with ink washes, for a while, and today seemed like the best day to do it. Took me 5 hours and done with ink and a wee little paintbrush! there are many things I don't like about it, but for my first ink portrait, it's pretty darn good, if i do say so myself. Was supposed to lay horizontal, but I thought it looked much MUCh better this way up. Enough of my crap, go forth and mingle! Beautiful rich modeling you achieved with the ink washes. Thumbs up! i was wondering how you got the gradient wash with the ink?did you use a thick brush and dilute the ink with water? my inkin always comes out solid and i need to hatch to create gradient. Hey thanks for the comment! to get that gradient for the face, i soak my brush in ink and then dilute it (which probably wastes ink but ah well haha), test is on a scrap of paper and then paint a very light basic shade. then repeat the process, making layers as i go. With the background i wasn't sure how to do large spaces, so I wet the paper first and used lightly siluted ink and swept over it with a bigger brush. really your first work with ink? can't believe it, it looks so expressive, very very well done! I think this one is particluarly good because you went with the flow rather than controlling everything about it! No problem. It inspired me to go out and buy some ink and try doing a portrait as well. (It's still in progress). Really loving the mood and feel! aw thanks i'm glad i could inspire you! sorry it took so long for me to get back to you. Hope you have fun with inking! best advice i can give: put down LOTS of newspaper if you're doing it on carpet! or maybe even better, don't do it on carpet. Every ink drawing i've done (and every one on carpet) i have spilt the ink. it's not worth it! loL! thank you so much i'm very glad you like it! thanks again! and for the fave! I have to say I am very impressed. I really like the technique you've got going on by using the ink in layers. Especially right above the nose and on the chest. I think there is something missing though. It doesn't really seem 3D. Which can only be because of shade/tone. Perhaps if the background was lighter you'd "pop" out more. And I'm sorry to say this, but the hand seems a little wonky. Around the fingernails. Hands generally are full of wrinkles and texture and lines. It would look awesome if you cropped it out. Nonetheless it still looks awesome! Great job. The ink you use, is it oil based? I all around love this picture. Going into my favorites! Could you tell me more about how to use ink like that?? I've never tried it before.. I'm doing a self portrait for school, and I love how this works. You did a beautiful job. thankyou so much! of course i can tell you how i used the ink! first to begin with , i drew a really light outline of the main features (the outline of the side of the face, the lips etc). i put the brush in the ink and then put it straight into a little cup of water to really dilute it. i check how light it is by quickly brushing it on a scrap of paper. after seeing if it's the right shade, i paint in all the parts needed for that shade (and leave the white highlights white). i always start insanely light and work my way layer by layer into darkness. simply amazing, everything about it too, kudos!! I love ink! WOOOoooo I love you!!!!! LOL"
i misses ya! when can we chat again? ive been living in a hotel for the past weeks its been posho!